There currently is an abundant knowledge-base to inform us that in schools teachers play the critical role in student learning and achievement. Research reveals that how teachers instruct and these interactions with students is the cornerstone around which to build effective schools. A summary of the available studies accumulated over the past 40 years on a key education driver, teacher competencies offers practical strategies, practices, and rules to guide teachers in ways to improve instruction that improves student performance and the quality of the work experience. Four groupings of these competencies can help organize and simply for teachers what they need to master to maximize their performance: classroom management, instructional delivery, formative assessment, and personal competencies. These four categories also provide the essential core around which decision makers can construct teacher preparation, teacher hiring, teacher development, and teacher and school evaluations. What are teacher competencies? Competencies are the skills and knowledge that enable a teacher to be successful. To maximize student learning, teachers must have expertise in a wide-ranging array of competencies in an especially complex environment where hundreds of critical decisions are required each day (Jackson, 1990). Few jobs demand the integration of professional judgment and the proficient use of evidence-based competencies as does teaching. Why is this important? The transformational power of an effective teacher is something many of us have experienced. Intuitively, the link between teaching and student academic achievement may seem obvious, but what is the evidence for it? Research confirms this common perception of a link and reveals that of all factors under the control of a school, teachers are the most powerful influence on student success (Babu & Mendro, 2003; Sanders & Rivers, 1996). What separates effective teachers from ineffective ones, and how can this information be used to support better teaching? We can now begin to build a profile of exemplary classroom instruction derived from effectiveness research (Wenglinsky, 2002; Hattie, 2009). Which competencies make the biggest difference? An examination of the research on education practices that make a difference shows that four classes of competencies yield the greatest results. Further, the research indicates that these competencies can be used to organize the numerous specific skills and knowledge available for building effective teacher development. Instructional delivery: Research tells us what can be expected from a teacher employing instructional strategies and practices that are proven to lead to increased mastery of lessons. Better learning happens in a dynamic setting in which teachers offer explicit active instruction than in situations in which teachers do not actively guide instruction and instead turn control over content and pace of instruction to students (Hattie, 2009). Is there a diverse set of practices that teachers can efficiently and effectively use to increase mastery of content for a variety of curricula? The structured and systematic approach of explicit instruction emphasizes mastery of the lesson to ensure that students understand what has been taught, become fluent in new material, and can generalize what they learn to novel situations they encounter in the future. The following are hallmarks of an explicit approach for teachers (Archer & Hughes, 2011; Knight, 2012). Teacher selects the learning area to be taught. Teacher sets criteria for success. Teacher informs students of criteria ahead of the lesson. Teacher demonstrates to the students successful use of the knowledge/skills through modeling. Teacher provides remedial opportunities for acquiring the knowledge/skills, if necessary. Teacher provides closure at the end of the lesson. A common complaint of an explicit instruction approach is that it does not offer sufficient opportunities for students to build on acquired knowledge/skills in creative and novel ways that help them to assimilate the material. The reality is that all effective instruction, regardless of philosophy, must aid students in generalizing newly taught knowledge/skills in a context that is greater than a single lesson. An explicit model accomplishes the goal of building toward “big ideas” by first emphasizing mastery of foundation skills such as reading and mathematics, and then systematically introducing opportunities to integrate these critical skills in discovery-based lessons to maximize students’ experience of success. Effective explicit instruction practices include these features. Well-designed and planned instruction: Instruction that is well planned moves students from their current level of competency toward explicit criteria for success. Instructional design with clear instructional objectives: The teacher should present these objectives to students for each lesson. Scope and sequencing: The teacher should teach the range of related skills and the order in which they should be learned. High rates of responding for each student to practice the skill: The teacher should provide sufficient opportunities for unpunished errors and ample reinforcement for success. Sufficient quantity of instruction: The teacher should allocate enough time to teach a topic. Teaching to mastery: Students need to learn the knowledge/skills to criteria that are verified by teachers or students’ peers. Teaching foundation knowledge/skills that become the basis for teaching big ideas: Current lessons should be built on past knowledge to increase fluency and maintain mastery of material. The teacher should relate lessons to complex issues and big ideas that provide deeper meaning and give students better understanding of the content. Classroom management: Classroom management is one of the most persistent areas of concern voiced by school administrators, the public, and teachers (Evertson & Weinstein, 2013). Research consistently places classroom management among the top five issues that affect student achievement. To put its in perspective, classroom management was associated with an increase of 20% in student achievement when classroom rules and procedures were applied systematically (Hattie, 2005). A good body of research highlights four important areas that classroom teachers should be proficient in to create a climate that maximizes learning and induces a positive mood and tone. Rules and procedures: Effective rules and procedures identify expectations and appropriate behavior for students. To be effective, these practices must be observable and measurable. Schoolwide rules and procedures: Clearly stated rules identify, define, and operationalize acceptable behavior specific to a school. These rules, applicable to all students, are designed to build pro-social behavior and reduce problem behavior in a school. They distinguish appropriate from problem behavior as well as specify consequences for infractions. Classroom rules and procedures: Another set of clearly stated rules establishes acceptable behavior specific in a classroom. These rules need to be consistent with schoolwide rules, but may be unique to meet the needs of an individual classroom. Proactive classroom management: These are the practices that teachers and administrators can employ to teach and build acceptable behavior that is positive and helpful, promotes social acceptance, and leads to greater success in school. The key to proactive classroom management is active teacher supervision. The practice elements that constitute active supervision require staff to observe and interact with students regularly. The goal is to build a positive teacher-student relationship by providing timely and frequent positive feedback for appropriate behavior, and to swiftly and consistently respond to inappropriate behaviors. Effective classroom instruction: The key to maintaining a desirable classroom climate is to provide students with quality instructional delivery aligned to the skill level of each student. This enables students to experience success and keeps them attentive. Behavior reduction: These practices, designed to reduce problem and unacceptable behavior, are employed in the event the first three strategies fail. 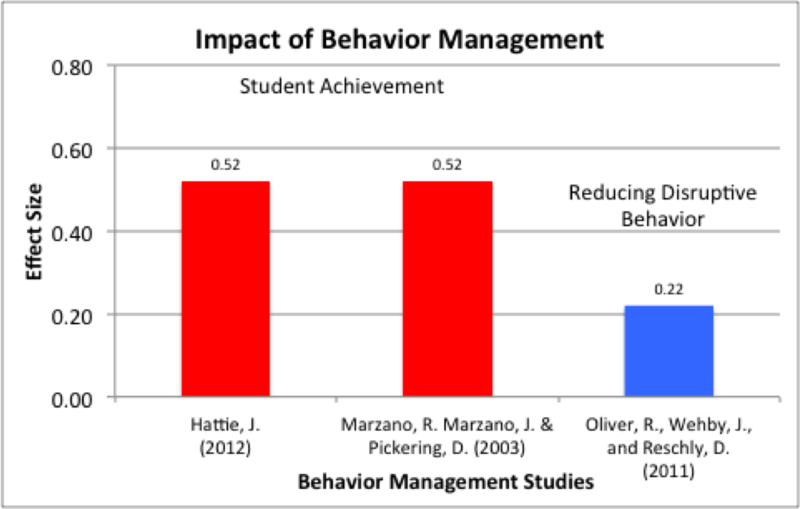 Behavior reduction strategies include giving students corrective feedback at the time of an infraction, minimizing reinforcement of a student’s unacceptable behavior, and guiding students in how to behave appropriately. Formative assessment: Effective ongoing assessment, referred to in education literature as formative assessment and progress monitoring, is indispensable in promoting teacher and student success. It is frequently listed at the top of interventions for school improvement (Walberg, 1999). Feedback, a core component of formative assessment, is recognized as an essential tool for improving performance in sports, business, and education. 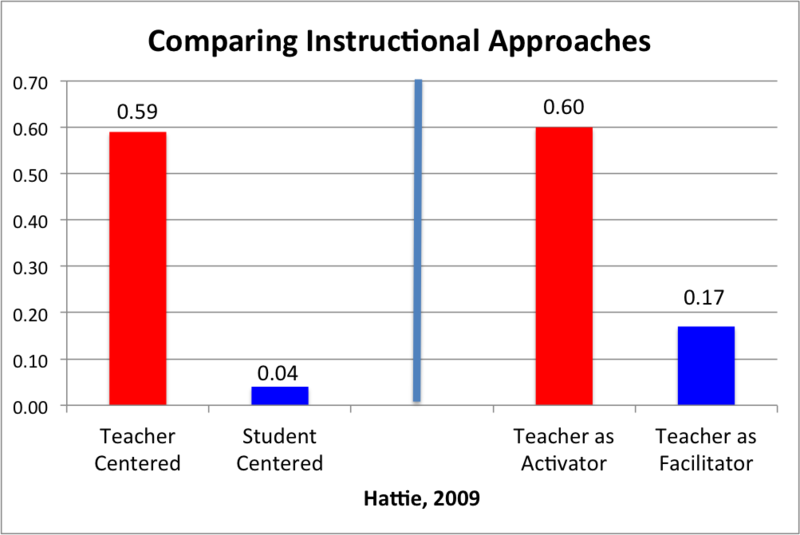 Hattie (2009) identified feedback as the single most powerful educational tool available for improving student performance, with a medium to large effect size ranging from 0.66 to 0.94. Formative assessment consists of a range of formal and informal diagnostic testing procedures, conducted by teachers throughout the learning process, for modifying teaching and adapting activities to improve student attainment. Systemic interventions such as Response to Intervention (RtI) and Data-Based Decision Making depend heavily on the use of formative assessment (Hattie, 2009; Marzano, Pickering, & Pollock, 2001). The following are the practice elements of formative assessment (Fuchs & Fuchs, 1986). Assessment: (Effect size 0.26) Assessing a student’s performance throughout a lesson offers a teacher insight into who is succeeding and who is falling behind. It is important that teachers collect and maintain data gained through both informal and formal assessments. Data display: (Effect size 0.70) Displaying the data in the form of a graphic has a surprisingly powerful effect on formative assessment’s usefulness as a tool. Data analysis following defined rules: (Effect size 0.90) Formative assessment is most valuable when teachers use evidence-based research and their own professional judgment to develop specific remedial interventions, before it is too late, for those falling behind. Personable competencies (soft skills): An inspiring teacher can affect students profoundly by stimulating their interest in learning. It is equally true that most students have encountered teachers who were uninspiring and for whom they performed poorly. Unfortunately, effective and ineffective teachers have no readily discernable personality differences. Some of the very best teachers are affable, but many ineffective instructors can be personable and caring. Conversely, some of the best teachers appear as stern taskmasters, but whose influence is enormous in motivating students to accomplish things they never thought possible. What soft skills do successful teachers have in common? Typically, the finest teachers display enthusiasm and excitement for the subjects they teach. More than just generating excitement, they provide a road map for students to reach the goals set before them. The best teachers are proficient in the technical competencies of teaching: instructional delivery, formative assessment, and classroom management. Equally significant, they are fluent in a multilayered set of social skills that students recognize and respond to, which leads to greater learning (Attakorn, Tayut, Pisitthawat, & Kanokorn, 2014). These skills must be defined as clear behaviors that teachers can master for use in classrooms. What does research tell us about personal competencies? Quantitative studies provide an overall range of effect sizes from 0.72 to 0.87 for effective teacher-student relations. 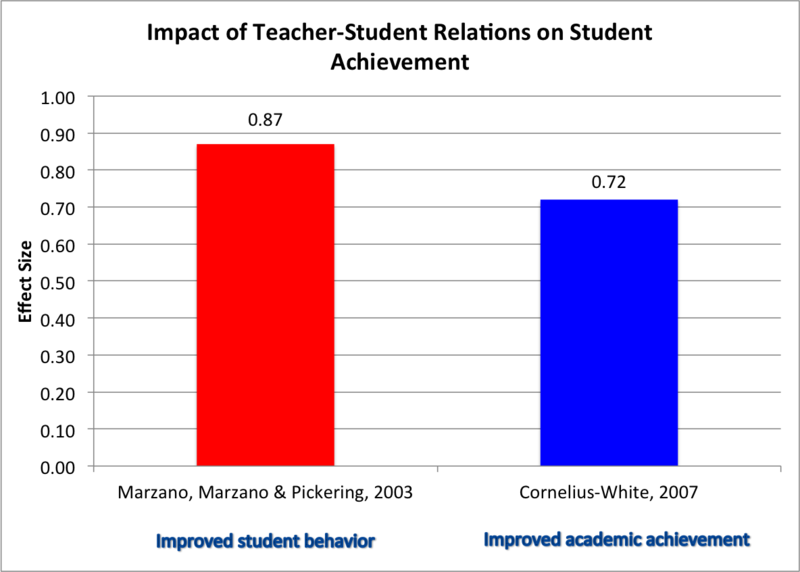 Better teacher-student relations promote increased student academic performance and improve classroom climate by reducing disruptive student behavior (Cornelius-White, 2007; Marzano, Marzano & Pickering, 2003). There is abundant research to support the notion that teachers play the critical role in improving student achievement in schools. What teachers do in the classroom is crucial in this process. The breadth of high-quality research accumulated over the past 40 years offers educators a clear picture of how to maximize teacher competency in four critical categories: instructional delivery, classroom management, formative assessment, and personal competencies. There is now ample evidence to recommend these competencies as the core around which to build teacher preparation, teacher hiring, teacher development, and teacher and school evaluations. Archer, A. L., & Hughes, C. A. (2011). Explicit instruction: Efficient and effective teaching. New York, NY: Guilford Publications. Attakorn, K., Tayut, T., Pisitthawat, K., & Kanokorn, S. (2014). Soft skills of new teachers in the secondary schools of Khon Kaen Secondary Educational Service Area 25, Thailand. Procedia—Social and Behavioral Sciences, 112, 1010–1013. Babu, S., & Mendro, R. (2003). Teacher accountability: HLM-based teacher effectiveness indices in the investigation of teacher effects on student achievement in a state assessment program. Presented at the annual meeting of the American Educational Research Association (AERA), Chicago, IL, April. Evertson, C. M., & Weinstein, C. S. (Eds.). (2013). Handbook of classroom management: Research, practice, and contemporary issues. New York, NY: Routledge. Hattie, J., (2009). Visible learning: A synthesis of over 800 meta-analyses related to achievement. New York, NY: Routledge. Jackson, P. W. (1990). Life in classrooms. New York, NY: Teachers College Press. Knight, J. (2012). High-impact instruction: A framework for great teaching. Thousand Oaks, CA: Corwin Press. Marzano, R. J., Marzano, J. S., & Pickering, D. (2003). Classroom management that works: Research-based strategies for every teacher. Alexandria, VA: Association for Supervision and Curriculum Development (ASCD). Marzano, R. J., Pickering, D., & Pollock, J. E. (2001). Classroom instruction that works: Research-based strategies for increasing student achievement. Alexandria, VA: Association for Supervision and Curriculum Development (ASCD). Sanders, W. L., & Rivers, J. C. (1996). Cumulative and residual effects of teachers on future student academic achievement. Knoxville, TN: University of Tennessee Value-Added Research and Assessment Center. Retrieved from http://heartland.org/policy-documents/cumulative-and-residual-effects-teachers-future-student-academic-achievement. Walberg, H. (1999). Productive teaching. In H. C. Waxman & H. J. Walberg (Eds. ), New directions for teaching practice and research (pp. 75–104). Berkeley, CA: McCutchen Publishing. White, W. A. T. (1988). A meta-analysis of the effects of direct instruction in special education. Education and Treatment of Children, 11(4), 364–374. Yeh, S. S. (2007). The cost-effectiveness of five policies for improving student achievement. American Journal of Evaluation, 28(4), 416–436. Teachers contribute to student achievement. As a practice, teacher evaluation has developed over time. Today, the focus of teacher evaluation is to determine the impact of teaching on student outcomes and for use as professional development. Research on teacher evaluation has produced mixed results. This overview provides information about teacher evaluation as it relates to collecting information about teacher practice and using it to improve student outcomes. The history of teacher evaluation and current research findings and implications are included. Cleaver, S., Detrich, R. & States, J. (2018). Overview of Teacher Evaluation. Oakland, CA: The Wing Institute. https://www.winginstitute.org/assessment-summative. Introduction: Proceedings from the Wing Institute’s Fifth Annual Summit on Evidence-Based Education: Education at the Crossroads: The State of Teacher Preparation. This article shared information about the Wing Institute and demographics of the Summit participants. It introduced the Summit topic, sharing performance data on past efforts of school reform that focused on structural changes rather than teaching improvement. The conclusion is that the system has spent enormous resources with virtually no positive results. The focus needs to be on teaching improvement. States, J., Detrich, R. & Keywroth, R. (2012). Effective Teachers Make a Difference. In Education at the Crossroads: The State of Teacher Preparation (Vol. 2, pp. 1-46). Oakland, CA: The Wing Institute. This commentary review the critical competencies for teacher success in the classroom. Twyman, J. S. (2013) Seven Habits of Superhero Teachers. Wing Institute. Date accessed: 5/7/14. How Much Formal Training Do Teachers Get? The analysis reviews school teacher earned degree data obtained from the National Center for Education Statistics (NCES) Digest of Education Statistics (2008). Keyworth, R. (2010). How Much Formal Training Do Teachers Get? Retrieved from how-much-formal-training. How important is it for teachers to receive subject matter training in order to obtain a teaching credential? This inquiry lookes at two meta-analyses on the importance of subject matter training in teacher pre-service instruction. States, J. (2010). How important is it for teachers to receive subject matter training in order to obtain a teaching credential? Retrieved from how-important-is-it. How important in increasing student achievement is the training of teachers in the subject matter they will teach students? This literature review tries to answer the question; does the quality and amount of subject matter pre-service training translate into better qualified teachers? States, J. (2011). How important in increasing student achievement is the training of teachers in the subject matter they will teach students? Retrieved from how-important-in-increasing. How Effective Are Principals in Assessing Teacher Skills? This is an examination of a tool used for assessing principal's accuracy in determining teacher’s abilities to effectively deliver instruction in a classroom. States, J. (2012). How Effective Are Principals in Assessing Teacher Skills? Retrieved from how-effective-are-principals. What are the key factors that influence student achievement? This is an analysis of a meta-analysis by Marzano, Waters, and McNulty undertaken to ascertain crticial factors that lead to higher student achievement. States, J. (2012). What are the key factors that influence student achievement? Retrieved from what-are-key-factors. What roles do principal's play that have the greatest impact on student achievement? This meta-analysis examines 26 studies on school leadership to identify the magnitude of direct and indirect effects of leadership on teacher and student performance. States, J. (2012). What roles do principal's play that have the greatest impact on student achievement? Retrieved from what-roles-do-principal's. What is a teacher's impact on student achievement? This review examines multiple meta-analyses on the power teachers play in student achievement. States, J. (2014). What is a teacher's impact on student achievement? Retrieved from what-is-teacher's-impact. This paper distills the research on effective teaching practices to basic assumptions and core practices. It presents a impact-cost paradigm for rating and prioritizing such practices. Heward, W. (2013). Effective Teaching Practices: Narrowing the Field [Powerpoint Slides]. Retrieved from 2013-wing-presentation-william-heward. This paper examines effective teaching, how to impart these skills, and how to best transition teachers into the classroom. Preparation practices are analyzed to determine how well we are succeeding in preparing teachers. States, J. (2010). What We Know About Teacher Preparation Programs [Powerpoint Slides]. Retrieved from 2010-aba-presentation-jack-states. Akmanoglu-Uludag, N., & Batu, S. (2005). Teaching naming relatives to individuals with autism using simultaneous prompting. Education and Training in Developmental Disabilities, 40(4), 401. This is a meta-analysis that examines teacher-student relations impact on student performance. Learner-centered teacher-student relationships are effective: A meta-analysis Retrieved from http://rer.sagepub.com/content/77/1/113.full?patientinform-links=yes&legid=sprer;77/1/113. The relative impact of long and short reprimands on children's off-task behavior in the classroom. This study compared the impact of long and short reprimands on children's off-task behavior in a classroom. Abramowitz, A. J., O'Leary, S. G., & Futtersak, M. W. (1988). The relative impact of long and short reprimands on children's off-task behavior in the classroom. Behavior Therapy, 19(2), 243-247. Soft skills of new teachers in the secondary schools of Khon Kaen Secondary Educational Service Area 25, Thailand. This research objective was to study soft skills of new teachers in the secondary schools of Khon Kaen Secondary Educational Service Area 25, Thailand. The data were collected from 60 purposive samples of new teachers by interviewing and questionnaires. The results of this study were informed that new teachers have all of soft skills at high level totally. Communicative skills were highest among seven of soft skills and next Life-long learning and information management skills, Critical and problem solving skills, Team work skills, Ethics, moral and professional skills, Leadership skills and Innovation invention and development skills were lowest in all skills. Based on the research findings obtained, the sub-skills of seven soft skills will be considered and utilized in the package of teacher development program of next research. Attakorn, K., Tayut, T., Pisitthawat, K., & Kanokorn, S. (2014). Soft skills of new teachers in the secondary schools of Khon Kaen Secondary Educational Service Area 25, Thailand. Procedia-Social and Behavioral Sciences, 112, 1010-1013. This paper is a review of the literature on classroom formative assessment. This meta-analysis looks at the effectiveness of two strategies in teaching motor skills to students: practice and reciprocal. The research examined two of the 11 teaching strategies identified in Mosston’s Spectrum of Teaching Styles designed for teachers in physical education. Six studies met the criteria for inclusion in this paper. The practice strategy involves the student in the decision-making process. The reciprocal strategy assigns each learner to a specific role: One learner performs the task and the other is the observer who offers immediate and ongoing feedback using a criteria sheet designed by the teacher. At the end of the practice, the students switch roles. The study showed a very large effect size of 1.16 for the practice strategy, and a large effect size of 0.94 for the reciprocal strategy. It would not be surprising to see these particularly large effect sizes moderated in subsequent replication studies (Makel & Plucker, 2014; van Aert & van Assen, 2018). The study confirms previous research on reciprocal teaching as an effective instructional strategy. Reciprocal teaching has been found to be a powerful strategy for teaching reading and other academic subjects. John Hattie (1995) reported an effect size of 0.74 for reciprocal teaching. The takeaway from this meta-analysis is that practice and reciprocal styles have positive effects on motor skill acquisition. Chatoupis, C., & Vagenas, G. (2018). Effectiveness of the practice style and reciprocal style of teaching: A meta-analysis. Physical Educator, 75(2), 175–194. Are teachers' impacts on students' test scores ("value-added") a good measure of their quality? This question has sparked debate largely because of disagreement about (1) whether value-added (VA) provides unbiased estimates of teachers' impacts on student achievement and (2) whether high-VA teachers improve students' long-term outcomes. We address these two issues by analyzing school district data from grades 3-8 for 2.5 million children linked to tax records on parent characteristics and adult outcomes. We find no evidence of bias in VA estimates using previously unobserved parent characteristics and a quasi-experimental research design based on changes in teaching staff. Students assigned to high-VA teachers are more likely to attend college, attend higher- ranked colleges, earn higher salaries, live in higher SES neighborhoods, and save more for retirement. They are also less likely to have children as teenagers. Teachers have large impacts in all grades from 4 to 8. On average, a one standard deviation improvement in teacher VA in a single grade raises earnings by about 1% at age 28. Replacing a teacher whose VA is in the bottom 5% with an average teacher would increase the present value of students' lifetime income by more than $250,000 for the average class- room in our sample. We conclude that good teachers create substantial economic value and that test score impacts are helpful in identifying such teachers. Chetty, R., Freidman, J. N., & Rockhoff, J. E. (2011). The long-term impacts of teachers: Teacher value-added and student outcomes in adulthood. (Working Paper 17699). Cambridge, MA: National Bureau of Economic Research. Every Student Succeeds Act, 20 U.S.C. § 6301 et seq. (2015). The purpose of this article is to provide an overview for those interested in the current state‐of‐the‐art in time management research. The review demonstrates that time management behaviours relate positively to perceived control of time, job satisfaction, and health, and negatively to stress. The relationship with work and academic performance is not clear. Time management training seems to enhance time management skills, but this does not automatically transfer to better performance.This review makes clear which effects may be expected of time management, which aspects may be most useful for which individuals, and which work characteristics would enhance or hinder positive effects. Its outcomes may help to develop more effective time management practices. Claessens, B. J., Van Eerde, W., Rutte, C. G., & Roe, R. A. (2007). A review of the time management literature. Personnel Review, 36(2), 255–276. The Institute of Education Sciences (IES) recently released a summary report of the impact of School Improvement Grants (SIG). The American Recovery and Reinvestment Act of 2009 provided states and school districts with $3 Billion for SIG. By accepting SIG grants states agreed to implement one of four interventions to improve the lowest performing schools: transformation, turnaround, restart, or closure. The goals of SIG were to improve practices in four main areas: (1) adopting comprehensive instructional reform strategies, (2) developing and increasing teacher and principal effectiveness, (3) increasing learning time and creating community-oriented schools, and (4) having operational flexibility and receiving support. The report finds minimal positive effects from the grants and no evidence that SIG had significant impacts on math and reading scores, graduation rates, or increased college enrollment. Dragoset, L., Thomas, J., Herrmann, M., Deke, J., James-Burdumy, S., Graczewski, C., … & Giffin, J. (2017). School Improvement Grants: Implementation and Effectiveness (No. 76bce3f4bb0944f29a481fae0dbc7cdb). Mathematica Policy Research. The purpose of this study was to examine the effectiveness of contingent teacher praise, as specified by Canter's Assertive Discipline programme, on children's on task behaviour. Continuous data collection indicated that following training in the appropriate use of praise, as specified by Canter, all three teachers successfully increased their rates of praising. Of the 24 children, all but one evidenced increases in levels of on‐task behaviour. Ferguson, E. & Houghton, S. (1992). The effects of contingent teacher praise, as specified by Canter's Assertive Discipline programme, on children's on-task behaviour. Educational Studies, 18(1), 83-93. This influential book is the result of 15 years research that includes over 800 meta-analyses on the influences on achievement in school-aged students. This is a great resource for any stakeholder interested in conducting a serious search of evidence behind common models and practices used in schools. Hattie, J. (2009). Visible learning. A synthesis of over, 800. 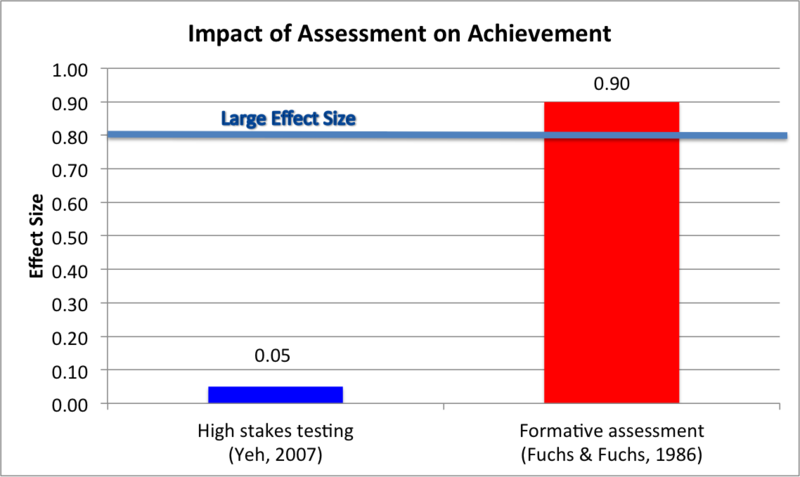 This meta-analysis examines the impact of formative assessment. Kingston, N., & Nash, B. (2011). Formative assessment: A meta?analysis and a call for research. Educational Measurement: Issues and Practice, 30(4), 28-37. Early intervention is key to preventing academic failure and referral to special education. General educators are responsible for providing primary instruction for students at risk for failure; however, the training they receive related to specific instructional strategies for these students is often insufficient (e.g., 1-day workshops). Alternative forms of professional development that include a combination of in-service and follow-up support have shown more promise in promoting changes in teaching behaviors. This study examined the effects of in-service support plus coaching on kindergarten teachers' accurate delivery of group instructional units in math. Teachers were trained to use a combination of whole-class instruction strategies, including model-lead-test for introducing new concepts and correcting errors, choral responding, and response cards. Results indicated that all teachers improved their delivery of instruction after the in-service training, with a second level of growth achieved after coaching. Teachers also reported high levels of satisfaction using the strategies. Kretlow, A. G., Wood, C. L., & Cooke, N. L. (2011). Using in-service and coaching to increase kindergarten teachers' accurate delivery of group instructional units. The Journal of Special Education, 44,234-246. "The Mirage" describes the widely held perception among education leaders that they already know how to help teachers improve, and that they could achieve their goal of great teaching in far more classrooms if they just applied what they knew more widely. However, research suggests that despite enormous and admirable investments of time and money, education leaders are much further from that goal than has been acknowledged, and the evidence base for what actually helps teachers improve is very thin. Like a "mirage," it is not a hallucination but a refraction of reality: Growth is possible, but the goal of widespread teaching excellence is further out of reach than it seems. This report presents findings from surveys and interviews and offers recommendations including: (1) "Redefining" what it means to help teachers improve; (2) "Reevaluating" existing professional learning supports and programs; and (3) "Reinventing" how we support effective teaching at scale. The following are appended: (1) The Mirage: Technical Appendix of Data and Analysis; (2) Detailed Summary Method for Estimating Teacher Improvement Spending; and (3) Overview of the Development Profile Analysis. Endnotes are also included. Walberg H. J. (1999). Productive teaching. In H. C. Waxman & H. J. Walberg (Eds.) New directions for teaching, practice, and research (pp. 75-104). Berkeley, CA: McCutchen Publishing. Barbash, S. (2012). Clear teaching: With direct instruction, Siegfried Engelmann discovered a better way of teaching. Education Consumers Foundation. The is a practical yet theoretically substantive book that aims to provide teachers with research-based, effective teaching practices. Borich, G. D. (1988). Effective teaching methods. Pearson Education India. This monograph summarizes a sample of programs and procedures demonstrated to work. Each program included in the monograph has been validated through solid scientific research. Crandall, J., & Sloane, H. (1997). What works in education. Cambridge Center for Behavioral Studies. High-Impact Instruction: A Framework for Great Teaching. This book offers strategies that make a difference in student learning including: content planning, instructional practices, and community building. Knight, J. (2013). High-impact Instruction: A Framework for Great Teaching. Corwin Press. This meta-analysis of findings from 108 studies shows mastery learning programs have positive effects on the examination performance of students in colleges, high schools, and the upper grades in elementary schools. Kulik, C. L. C., Kulik, J. A., & Bangert-Drowns, R. L. (1990). Effectiveness of mastery learning programs: A meta-analysis. Review of educational research, 60(2), 265-299. This study examines and compares the effectiveness of pre-teaching and re-teaching on math achievement and academic self-concept of third grade students identified as low achievers. Lalley, J. P., & Miller, R. H. (2006). Effects of Pre-Teaching and Re-Teaching on Math Achievement and Academic Self-Concept of Students with Low Achievement in Math. Education, 126(4), 747-755. This book offers a thorough array of practical teaching methods backed by rigorous research to have the greatest effect along with practical techniques to apply these in actual classroom settings. Petty. G. (2009). Evidence-Based Teaching: A Practical Approach. Nelson Thornes, Cheltenham, United Kingdom. This research synthesis examines complex issues that must be addressed in the building student personal competencies. The effects of teacher questioning levels on student achievement: A quantitative synthesis. This meta-analysis examines the effects of teachers use of higher order questions on student achievement. Samson, G. E., Strykowski, B., Weinstein, T., & Walberg, H. J. (1987). The effects of teacher questioning levels on student achievement: A quantitative synthesis. The Journal of Educational Research, 290-295. This book looks at research and theoretical models used to define educational effectiveness with the intent on providing educators with evidence-based options for implementing school improvement initiatives that make a difference in student performance. This study is a research synthesis comprised of 11,000 statistical findings that shows a consensus on the most significant influences on student learning. Wang, M. C., Haertel, G. D., & Walberg, H. J. (1997). What Helps Students Learn? Spotlight on Student Success. The purpose of this review is to summarize research on the effectiveness of guided notes. CALDER is a National Research and Development Center that utilizes longitudinal state and district data on student and teachers to examine the effects of real policies and practices on the learning gains of students over time. The Center for Educational Leadership provides research and training in teaching effectiveness and school leadership. The Center on Great Teachers and Leaders (GTL Center) is dedicated to supporting state education leaders in their efforts to grow, respect, and�retain great teachers and leaders for all students. CTL is research center that conducts and disseminates research that focuses on practical solutions to serious problems in school systems. CCSSO is a nonpartisan, nationwide, nonprofit organization of public officials who head departments of elementary and secondary education in the states, provides leadership, advocacy, and technical assistance on major educational issues. Edutopia focuses on practices and programs that help students acquire and effectively apply the knowledge, attitudes, skills and beliefs to achieve their full potential. The Joyce Foundation invests in and focuses on today's most pressing problems while also informing the public policy decisions critical to creating opportunity and achieving long-term solutions. The work is based on sound research and is focused on where it can add the most value. K-12 Education works to make sure tools, curriculum, and supports are designed using teacher insights. The (MET) project was designed to find out how teacher evaluation methods could best be used to improve teaching quality. NCTAF is a bipartisan endeavor to engage experienced policymakers and practitioners in researching the entrenched national challenge of recruiting, developing, and retaining teachers. The National Council on Teacher Quality works to achieve fundamental changes in the policy and practices of teacher preparation programs, school districts, state governments, and teachers unions. The New Teacher Center provides research, policy analyses, training and support for improving new teacher support and induction. The SASS is a system of related questionnaires that provide descriptive data on the context of elementary and secondary education and policymakers a variety of statistics on the condition of education in the United States. The goal of the WWC is a resource for informed education decision-making. The WWC identifies evidence-based practice, program, or policy, and disseminates summary information on the WWC website.